Devvy Kidd -- "We Have Got to Eliminate The Gringo"
"WE HAVE GOT TO ELIMINATE THE GRINGOS"
The words above were spoken by Jose Angel Gutierrez, professor, University of Texas, Arlington and founder of the La Raza Unida political party. His full comment was: "We have an aging white America ... They are dying ...We have got to eliminate the gringo, and what I mean by that is if the worst comes to the worst, we have got to kill him." In a column dated March 25, 2006, by Ernesto Cienguegos titled "La Gran Marcha" surpasses all expectations," Cienguegos wrote: "What does the immense success of "La Gran Marcha" mean to Mexicanos and other Latinos? It simply means that we now have the numbers, the political will and the organizational skills to direct our own destinies and not be subservient to the White and Jewish power structures. It means that we can now undertake bigger and more significant mass actions to achieve total political and economic liberation like that being proposed by Juan Josï¿½ Gutiï¿½rrez, President of Movimiento Latino USA. Juan Josï¿½ Gutiï¿½rrez is proposing that the coalition that organized "La Gran Marcha" meet in Arizona or Texas on April 8 to "organize a mass boycott (huelga) against the economy of the USA" to take place on May 5 or 19." As Professor Gutierrez is proposing killing gringos, the message from Cienguegos becomes crystal clear. Make no mistake about it and I said it in my last column: millions of illegals are blatantly shoving their lawlessness right in our faces with the backing of cowardly politicians at all levels. The talk all week on cable and radio has been about the November elections and how the Republicans can't afford to alienate the Latino vote. Not about the law, not about the massive destruction to our country from this invasion, just protect their political butts at all costs. Yellow bellied cowards. Every American and legal alien should watch a few of these videos to see exactly what the "Mexica Movement" is all about and exactly how serious these invaders are; see here and here. "Hello, look im an american born and raised in USA and im happy to be white but what i do have to say to u is why r u so rude. I have been married to a hispanic for more than 9 years and i have three very smart and cute sons and i think what the hispanics are doing is right and they should have the right to work." Sorry, lady, but this isn't about your martial situation or race, it's about the law. Certainly humans in every country on the globe have the absolute right to work, but illegals have NO constitutional rights in America. They do not have the "right" to work when they have committed a criminal act to get into our country - regardless of the country of origin. "hey man, yup u guess rigth is a MEXICAN who dont know how to spell, but i wont need it becouse im sure u know what i wanna tell u, thats why i just wanted to tell u somethin alse, that u r a very ignorant person that doesnt know what is it to be poor... think about it. PEACE!!!" There are millions of poor Americans in this country, but they don't break the law. This isn't about being rich or poor, it's about violating federal immigration law. On March 29, 2006, I did a radio show out of Oregon. Some hysterical hen called in and accused me of being a racist, practically another Adolph Hitler and the rest of the drivel being pumped to get away from the real issue: Regardless of country of origin, if you smuggle yourself into this country, you are in violation of the law and must be deported. Many don't realize that there are several million illegals from countries like Ireland, Commie China and Russia. It's not about a person's race or religion, it's about the law. "You are right on! My son was attacked by about 200 out of control Mexican Youths this afternoon in Anaheim, California while sitting at a signal light. They threw plastic bottles of water and kicked in the door of his pickup truck. He did nothing to provoke the attack and they were shouting "we're Mexicans and proud of it among other things including calling him a f****ng Gringo. "Fearing for his safety he called the Police on his cell phone and they apparently were already enroute as the Swat Team arrived with riot gear and guns drawn. He pointed out the two he thought kicked in his door and the cops handcuffed them for a few minutes and them let them go! Go figure! Three Freeways were shut down this afternoon around Orange and L.A. County as the demonstrators got on the freeway and stopped traffic for a time until the CHP herded them away. So the answer is no, this state nor any of the others are prepared for what is yet to come. An avid reader of your columns." 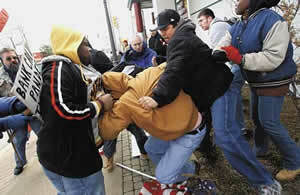 (Name withheld) Palm Springs, Calif.
On March 25, 2006, members of the Indiana Federation for Immigration Reform and Enforcement and the Chicago Minuteman Project were attacked outside the Bank Calumet in Munster. Federation and Minuteman members were protesting the bank offering home loans to illegal aliens. These banks are knowingly and aggressively violating federal law while Bush's Department of Justice turns a blind eye. Think this isn't coming to cities and towns all across America? Think again. "45 years ago we white's were doing the jobs that no American would do. We were picking olives in California. We asked for $1.00 per box, instead of .90. They fired every one of us and brought in 20,000 Mexicans from across the border. We knew then it was the beginning of the end. We picked oranges in Redlands Calif. They brought in illegals and paid them .10 more per box than they gave us white's that wouldn't do the work that Mexicans would. Claiming they worked harder. We were locked out of Senator Sid Morrison's orchard as he told us he could get illegals for $3.00 per bin to pick his apples and had to pay us $5.00." "Devvy: When I hear the politicians repeat the outrageous lie that illegal aliens are only taking jobs Americans don't want, I would like to strangle them. For the past year, my parents have been hiring unemployed Americans from the so-called "lower rungs" of the economic ladder to do work around the house. They are unemployed because they have been pushed out of the job market by illegal aliens. An employer can hire two or three illegals for the price of one American, so why hire Americans? "Another outrageous lie is used by politicians for maintaining the H-1B visa program. They claim that there are not enough Americans available to work in the high-tech industry so they have to import workers from India. If this is the case, then why was I, a senior software engineer, laid off from my job in 2004 and replaced with Indians? Why are so many other Americans I know in the software business unemployed?" It's not that American workers won't do the jobs, it's that un-American companies want the job done for poverty wages to increase their bottom line. Dump on Americans, hire illegals. More money and who cares who gets hurt along the way? Well, you won't get my money because I know who you are. I refuse to buy foreign and I refuse to buy anything from companies that hire illegals. Your products can sit on the shelf and rot for all I care. Illegals smuggling themselves across our borders isn't about jobs, it's about the law. Americans were doing these jobs before the invasion began and they will do them again. Any company that hires illegals has the blood of innocents on their hands. Americans, law enforcement and border patrol have been slaughtered by these illegals smuggling themselves into the U.S. for "cheap" labor for employers who have no regard for the law. Vicious drug smugglers who don't care who they shoot are entering this country at will. Those employers who seek this "cheap" labor have done so without regard to the collateral damage along the way. They don't care. The bottom line ($$$) is everything. This is rewarding criminals (illegals). If someone breaks into your home, do you turn around and reward them with leaving the door unlocked the next night to have another in a long line break in? No, you hold them accountable. Do the crime, pay the price. The current immigration reform bills in Congress are worthless. It's the same darn broken song that Reagan sang and signed into law in the mid-80s that provided further incentives for illegals to cross our borders. That so-called "immigration reform" act did nothing to stem the invasion, it only made it worse, just like this "new" one. It will give a back door amnesty to these criminals already here sending the message to others that it's okay, go ahead and break America's laws. Their politicians are too cowardly and scared of us to do anything about it. We will march and riot and burn cities to the ground and in the end, we will get our way. Politicians in America only care about votes! As Congressman Tom Tancredo said last week: We do not need this latest legislation, we need to enforce the laws already on the books. I called my Congress critter and Feinstein's offices and told them to vote NO on this legislation. Instead, enforce existing laws. This new "reform" bill will allegedly double border agents by 2011. Hello? The crisis is here now and our border agents are being run to ground with their lives on the line every day. The big question now is will the American people fight or will they simply remain too busy to do anything about it? I know there are millions who are on the front lines, but we need to bury our state capitols in snail mail and demand they reconstitute the state militias. When all hell breaks loose and it will (those two examples above are just the beginning), there isn't enough law enforcement or National Guard to stop the hordes which will include drug runners and terrorists. I urge you to send a snail mail letter today or this weekend to your state representative, state senator, governor and county sheriff. My mail box has been full of requests that I make available copies of my letters to my county sheriff and state legislators on the national ID and un-Patriot Act issues. I'm sure there are others who can write more eloquent letters than I can. But, pease feel free to use these letters as a guideline. If you want, cut and paste mine and just substitute your name, city, state and so forth. Letter on illegal invasion here. Letter on National ID here. Letter on un-Patriot Act here. It's not enough to call talk radio, we have got to flood our lawmakers with hard mail in their faces. If you belong to a group or organization, do one letter with a signature sheet and have everyone in your group, organization or at a meeting sign and send it. That way, the letter gets done by one volunteer, but is signed by 10 or 20 or 50 Americans. Get down to your VFW hall or the local grange this weekend. You retirees - grandma and grandpa: get out of the casinos and get busy. The polls show that a huge majority of Americans are demanding the borders be sealed and the illegals deported. Now we need every single person to conduct this relentless assault on our state houses and Congress. If you don't know who your state rep or state senator is, just do a google search and type in your state and then the words state legislature. We need every able bodied man and woman to call the U.S. Congress and demand NO amnesty, no free pass. We demand all illegals be rounded up and deported, period. We demand that the Department of Justice begin prosecuting all bank CEOs, presidents and bank managers for violating federal law in giving home mortgages to illegals. You can call Congress toll free at: 1.866.340.9281. I also urge you to call their individual offices every day and keep it up. It only takes a few minutes out of your busy day. Bury their offices in phone calls. Make sure your voice is heard. Go to www.house.gov and www.senate.gov to find your representative and their phone numbers. Call them everyday. It's most unfortunate the states of the Union have refused to recognize the non-existent Seventeenth Amendment because if that fraud were exposed, the states would be able to recall vermin like John McCain, Arlen Specter, fire them and appoint U.S. Senators to Congress that would not sell us out on this critical issue because they would represent the interests of the state. Boycott companies that hire illegals. Go to this web site to see companies that knowingly hire illegals. The only language these people understand is money and I urge you to stop funding the destruction of our country. Stop giving your money to employers who are directly responsible for encouraging lawlessness that has killed innocent Americans, not to mention Americans who are victims of violent sexual predators, gang members and drug smugglers. Do not vacation in Mexico, hold corporate conferences or buy their sub standard fruits and vegetables. Use the HUGE power of America's wallets. Support The Minutemen and the other fine organizations that are on the front lines fighting every day. The Minutemen, Americans for Legal Immigration, American Patrol, Frosty Wooldridge's action alert and NumbersUSA (Excellent analysis on the bills). Get the Dr. Edwin Vieira special CD ($2.00) and include a copy with your letter to your county sheriff, state rep, state senator and governor. For a full description of the contents of the CD, click here and scroll to the bottom. These elected public servants are buried during the day, but they can listen to the CD on the way home. After you send it, wait one week and then call their offices and ask if they have listened to it. If they respond no, my advice would be to tell them to go find another job the day after elections. I'm in the face of my elected servants, please do the same. If we don't stop this invasion now and stop another free pass, the Kiss of Death will be upon this republic. It is the intention of militant organizations and their millions of illegals from Mexico to take over the four border states with violence if necessary and their cannon fodder is already here. You see how well organized the illegals are? They will continue to grow in numbers. Will Americans do the same to save our beloved republic and protect our families and property? The big question now is will the American people fight or will they simply remain too busy to do anything about it?